THE most serious question at Sotomayor’s hearing was asked by… Franken? Holy Hemiola, Republicans are a repetitive bunch. Did any one of them ever have an independent thought? The way they zeroed in on her “wise latina” word combination was like some SETI scientists looking for meaningful patterns in vast field of verbal graffitti, like none of the other billions of words Sotomayor has ever uttered made sense. In some very no-so-subtle ways, they managed to communicate that a latina woman should show more deference to a southern white gentleman, that life experiences are strictly forbidden for Democrats but perfectly OK for Republican nominees like Concerned Alumni of Princeton Alito and “high tech lynching” Thomas, and that with 7 white men out of 9 members of the court (that’s 78% for those of you who are keeping track), this is a population that needs to be protected, the poor things. Let me get this straight: white males are the downtrodden of the earth, put upon and underpriveleged and that’s why we need so many of them on the court. Women? ehhhhh, not so much. I would hope that women voters in Republican districts would keep this in mind when they go to the polls in 2010 but as my mom says, people have short memories. They will forget what empty headed, arrogant, clueless, condescending jerks Jeff Sessions and Lindsay Graham were. Now, you may be wondering why Franken would be concerned with “net neutrality”. I’m going to take a guess here that it’s for the same reason he was a founding member of Air America. Back in 2003, corporate media controlled the horizontal and the vertical. Well, it still does. The propaganda might be coming from a pseudo-Democratic White House but it’s still propaganda and there are precious few sources of push back. Air America’s flagship station was a tiny station in NYC, WLIB, with a very weak signal. In central NJ, just 36 miles away, I could barely pick it up on my car radio. During some of the more critical news stories of 2003-2004, I couldn’t get it at all. There was a competing station from Indiana, of all places, that was a superbroadcaster. The Indiana station would crank up the volume up to 11 and blast right wing talking points, overwhelming that tiny whisper from Air America. I noticed that Indiana wouldn’t always be blasting away. It only happened when I wanted to hear a different opinion on an important news story. That left me with live streaming Air America from the internet. Now, I might live right in the heart of telecommunications R&D central, not far from ATT and Lucent and all the rest. But my internet providers are very, VERY limited. There are days that I swear they are blocking access or slowing down the download speeds to sites I want to access. I’m sure I’m just being paranoid but isn’t this Franken’s point? The corporations might say they own the cables but *WE* paid for them. Everytime we made a phone call or emailed our mothers or purchased that electric raclette grill from amazon or downloaded Lady Gaga from iTunes, we pay for laying down new lines through the hefty fees added to our bills every month. Isn’t that the excuse that these companies are always making for raising the rates? They have to add new lines, update the technology? Ok, we paid for that. Did we forfeit our right of free speech when we entered into an agreement with these companies? That is essentially the question Al Franken asks. Sotomayor responds that it depends on the policy established by Congress. Ahhh, back to those bastards. So, if Congress gives away the store to ATT, FIOS, Embarq and the like, is our only recourse to vote them out of office? And if we want to run alternative candidates, how to we make sure these candidates get a fair hearing? The internet has the capacity to change the electoral landscape by allowing candidates to circumvent the corporate media gatekeepers. But if you don’t have free, unfettered access, is this really possible? Is it possible that in 2010, we will see candidates who want to primary incumbents blocked by service providers from doing so? The problem is not a hypothetical “maybe”. It could happen now. The question goes to the very heart of our system of democracy. The right to free speech, to be heard, to foment insurrection if necessary, was the first right that was granted to us in the Constitution by people who knew what it means to need to overthrow your government. These days, we would prefer to overthrow our government at the ballot box. But if you can only make your voting decisions based on disinformation, if it is legal for corporations to promote disinformation for its own benefit and if those corporations are granted the protection of “personhood”, doesn’t this infringe on the rights of the individual to be heard and have the power of full citizenship? We need only look to Iran for the answer to this question. Their election was highly questionable, so highly questionable that they demanded a recount or a new election. Instead, the government cut off their access to the internet, their ability to organize and then ruthlessly suppressed the protestors. Could it happen here? Hell, yes. All we need is a bunch of hyperbolic blowhards on cable news networks terrifying people into thinking it could provoke another 9/11 and we’re there, baby. How do we prevent that from happening? That’s essentially what Franken is asking. How do we exercise our free speech when someone else has our voice and can turn down the volume? Does that old playground boast, “It’s a free country, I can say whatever I like” still have any real meaning? Sotomayor’s answer, to me, was less than satisfying. I think she will be deferential to the corporation’s lawyers when the issue finally makes it to the USSC. I’ve been wrong before but let’s just call it a hunch. It’s like her answer on abortion. Yes, women have a right to privacy with their doctors- under certain circumstances. Maybe I’m dense or something but if someone else is setting the “circumstances” under which you have a right to privacy, then there isn’t much privacy. But I digress. 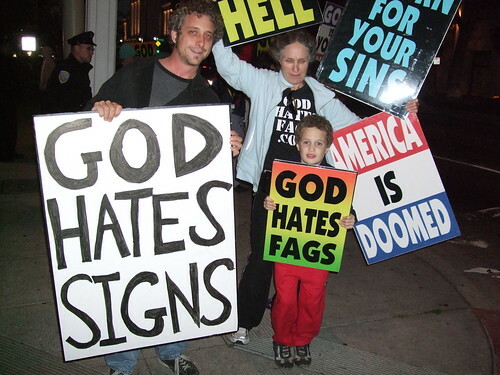 The more important issue is freedom of speech. It precedes all others. It allows you to question authority and persuade your fellow citizens. Without it, there would be no discussion of abortion or gun rights or health care. Or at least, no competing opinions. And as technology has changed the way we access our information, allowing us to benefit from the internet’s advantages of speed and relational information, those of us who do not control that access will be at a severe disadvantage as citizens. We might as well be wearing a gag. Which is just how the monopolies like it. Podcast of the day: Control of the media has been going on ever since there was a printing press. Check out Melvyn Bragg In Our Time’s Seventeenth Century Print Culture. King Henry VIII was one of the first to crack down on the press by banning the vernacular bible and forbidding women and servants from reading it. They might get the notion that they knew what it meant. Sounds like Lindsay Graham’s kind of guy. Sonia Sotomayor pushed back vigorously Tuesday against Republican charges that she would bring bias and a liberal agenda to her seat as the first Hispanic woman on the Supreme Court, insisting repeatedly she would be impartial as GOP senators tried to undercut her with her own words from past speeches. Sotomayor, 55, kept her composure — judge-like, supporters said — during the intense day of questions and answer, listening intently and scribbling notes as senators peppered her with queries, then leaning into her microphone and gesturing for emphasis as she responded. She returns for another full day of questioning on Wednesday. “My record shows that at no point or time have I ever permitted my personal views or sympathies to influence the outcome of a case,” the appeals court judge declared during a tense exchange with Sen. Jeff Sessions of Alabama, the top Republican on the committee that is conducting this week’s confirmation hearings. He repeatedly questioned her ability to be objective as a Supreme Court justice, citing her own comments. Republicans sounded unconvinced by Sotomayor’s defense. “I am very troubled that you would repeatedly over a decade or more make statements” like the one in 2001, Sessions said. 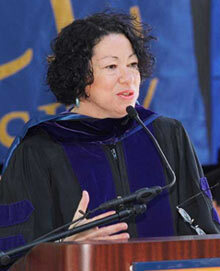 And Sen. Lindsey Graham, R-S.C., said Sotomayor’s answers Tuesday were starkly at odds with her previous comments. “That’s what we’re trying to figure out — who are we getting here?” he said. During her first chance to answer questions publicly, Sotomayor stopped short of calling the right to abortion settled law but also said, “All precedents of the Supreme Court I consider settled law subject to” great deference but not absolute. Under repeated questioning, she said she’d have an open mind on gun rights. She also defended her most frequently criticized ruling: a decision by a three-judge panel of the 2nd U.S. Circuit Court of Appeals last year to dismiss the claim of white firefighters in New Haven, Conn., who alleged racial discrimination after being denied promotions. Sotomayor said the lawsuit, in which New Haven scrapped the results of a promotion test because too few minorities did well, was not about quotas or affirmative action. “We were following precedent,” she said. Leahy was the first to question Sotomayor on the case, and he teed up a sympathetic portrayal of her approach, saying she would have been criticized however the panel had ruled — “You’re damned if you do and damned if you don’t,” he said. Prodded by Leahy, Sotomayor said she “absolutely” would have approached the case differently in light of the new standard she said the Supreme Court laid out in its recent ruling. Sotomayor, who hasn’t ruled on the issue during her 17 years on the federal bench, shed little light on her view, confining her answers to legal-speak that never went beyond what the high court has said on the subject. She said the right to abortion is “the Supreme Court’s settled interpretation of what the core holding is,” as affirmed in a separate 1992 ruling. Under questioning by Graham, she also professed ignorance of cases in which the Puerto Rican Legal Defense and Education Fund, a civil rights group she advised as a board member between 1980 and 1992, argued for taxpayer-funded abortions. “I never reviewed those briefs,” Sotomayor told Graham. Leahy was first to ask about the “wise Latina” comment that has sparked so much controversy. It’s all Kabuki anyway – the Republicans don’t have the votes to block her. They’re just posturing for the folks back home. “I don’t believe for a minute that there are any differences in our approach to judging, and her personal predilections have no effect on her approach to judging,” she told Washington Wire. “We’d both like to see more women on the courts,” she added.